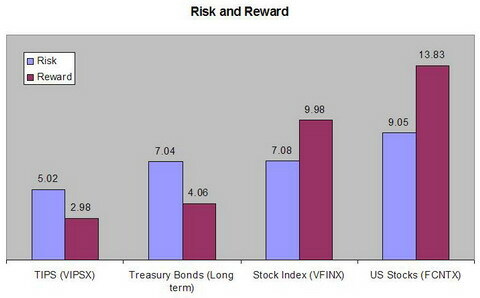 Contrary to what we usually believe that investing in Treasury bills/bonds involves less risk, the relationship between bonds and stocks says investing in stocks is far more rewarding than investing in bonds, even for a period of three years. Though the fact that we are in a bull market since 2003 may tilt the balance toward stocks for the above examples, the Kiplinger’s article uses historical data to argue that over long-term, stocks produced far more returns than bonds did. That being said, does it mean that we should ignore bonds and bills and put all of our money in stocks? A simple example will answer this question. In 2001 and 2002, VIPSX’s total returns are 7.6% and 16.6%, respectively. During the same time period, VFINX returned -12.0% and -22.2% annually, respectively. Eventually, it all comes down to a sound asset allocation plan that fits an investor’s investment objectives. 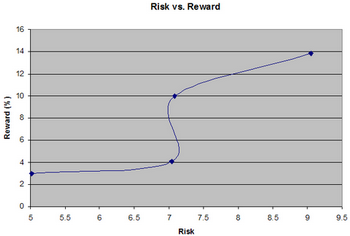 The following risk-reward chart based on the Efficient Frontier thory should give us some ideas on the optimum relationship between risk and rewards. Jeremy Siegel’s book, “Stocks for the Long Run”, makes an authoritative case for stocks as the investment of choice for medium and long-term investing. The stock market has both the highest historical real return and lowest risk (standard deviation) over long periods of time than bonds/T-bills. Siegels’ study includes a worst-case analysis, including buying at the peak of a bull, and still shows conclusively the historic resiliency of stocks as the least risky inflation-fighting vehicles over the long term.